In 2014, I think the blog has grown quite a bit - nowadays, getting 1000+ views per day when I'm actively blogging is the norm... I even got up 4000 one day (I know it's chicken change for a whooooooole bunch of others, but we're celebrating my PROGRESS here)! This year, I also redesigned the blog, as I had gotten weary of the old design. I'm thinking about doing another one in the coming year - what do you think? 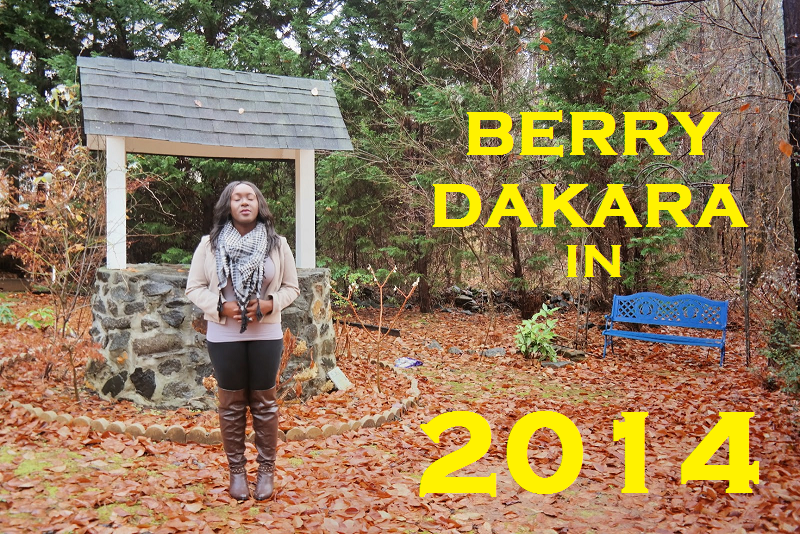 I also purchased my own domain, so you can go directly to Berrydakara.com now and get all the latest gist. I'm not self-hosting though, but who knows what will happen. In addition, I opened a Facebook page (Please like the page!!!) and have managed to snag over 100 followers. There are also 100+ followers on Bloglovin, and I crossed the 1,000 mark on Instagram. Meanwhile, I need to be more active on Twitter and utilize Pinterest well. My answer to the question, How is Married Life? This is my last post for 2014. I hope and pray for a much better 2015 with growth, productivity, advancement, tenacity, and more. Thank you for a sweet 2014 and being my extended e-family. I really appreciate all of you. Remember the first person who remembers what DD's are gets a present from me! DING DING DING DING DING!!! We have a winner!!! Woot woot! Okay, send me an email letting me know where you are and we'll take it from there. Happy New year Berry! Unto greater things! Woo hoo! DD stands for Dakara Dahlings! GAMBIA! Wow! I hope things have calmed down there. I finally met you in 2014!! Yay!!!! :) Its been fun reading your posts. Great job hun! you did well. To be honest I truly respect bloggers that blog great content consistently e no easy. Just saw the word press thingy, WATTTT! great stuff, love it! Shey Wordpress!!!!!!?????? Way too cool! WHOA! F'reals? I'm honored o! Can I win free products every month? Awwww.....congrats on your blog doing so well. Xoxo. DD's stands for Dakara Dahlings! your blog has been really fun and entertaining this year.. Thank you so much for your very very kind words. Wishing you a great 2015 as well! Nice run down memory lane, the blog had definitely been interesting. Happy New Year! Thank you Bee! Happy New Year!